Let me introduce myself. I am W. (Bill) Homeijer, 74 years old, and born in Amsterdam. In this account, please do not pin me down on exact dates. There are some blank spots in my memory. In 1943, at the age of 18, I was forced to join the "Arbeidsdienst". This was a kind of conscription established by the Germans to do forced labor. Most of this was on the land such as harvesting potatoes and other farm work. I did not want to go but my parents were afraid. I went but escaped a few days later to return to Amsterdam. As they say, I went 'underground' by staying with friends, but not for long. I assume someone tipped off the police. They found me, put me in jail and brought me back to the barracks in Diever (Holland). The Commanding Officer again put me in jail for 14 days. After being released, I escaped the Arbeidsdienst for the second time. I left during the night accompanied by two other boys. One of the boys named Timmermans, who came from Delft, had told me he wanted to go home the next day and that was that. We never heard of him anymore. I had told the other boy, Jan ten Hove, who was 17 at the time, that I could not go back to Amsterdam. It was my in-tention to go to England however silly, foolish or thoughtless the idea was. Jan stayed with me and after a lot of tension and adventures we arrived in the north of France. We had been very lucky during our journey which had taken weeks. Another bit of good luck was being picked off the street by the French Underground movement, the FFI. They eyed us with suspicion until we were screened and, after a while, approved. The FFI talked the idea of going to England out of our heads. They said too many dangers made it not possible. They advised us to stay with them in the woods of northern France in the vicinity of the villages of Cousolre and Hestrud. We stayed and much later I realized that our staying was better for them. They had recruited two new members. Deep in the forest they had camps from where they (we) raided and assaulted German convoys. In the camp lived men and women and even German POWs. Some German soldiers defected to the French and were treated rather well. These defectors were usually older soldiers who no longer agreed with the war. They worked in the camp cleaning up and such. However, when SS soldiers were taken prisoner, they were shown no pity. For someone like me who was still in high school and had lived a sheltered life, it was a different world. Our daily routine included protecting our camps. We walked on patrol with 1 or 2 others. Sometimes we went with more into the hills and watched the roads. When German trucks or other vehicles approached they were fired on and, if possible, they were destroyed. German vehicles tried to pass through our area as fast as they could. However, they sometimes found trees downed across their path. Drivers who left their car were taken prisoner. But when the numbers of cars were to big, we let them go. Also, tanks never were attacked. The Germans knew there were French partisans in the woods and sometimes tried to enter with greater numbers. But they never went in too far. I guess they did not have troops enough in that part of Northern France and there were more of these French units in the surrounding places. So what did we do to the Germans? We tried to do to them as much as harm as we could. This was guerilla warfare. The weapons we had were light. I, for example, had a double-barreled shotgun, others had Stanley guns, and others had German arms. It was really a mixture of all kinds of weapons but we had no heavy guns. No artillery or such. That's why we never attacked tanks or armored cars. We lay in ambush, fired and withdrew. Another FFI routine was to acquire provisions. The FFI went into the villages to (voluntary) force the farmers to help and supply the men and women with fresh meat, eggs, milk etc.. Food and weapons were air-dropped by the British R.A.F to supply the main camp. As I recall, there was no shortage of either. When we heard about the invasion, crates of champagne appeared. Then came June 1944, the invasion. We all followed what happened, then the breakthrough. 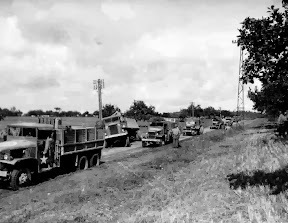 Allied troops were moving forwards, nearing Paris. Suddenly we heard that U.S. troops were in the neighborhood. At that moment we told our commander we wanted to leave and if possible wanted to go with the American army. We wanted to go up north, back to Holland, back to our families. So we did. A US convoy arrived in the village of Cousolre, I think, with tanks, trucks, jeeps, and all kind of stuff we had never seen before. We asked for the CO. Someone took us to a colonel. He looked at us and was not surprised at all. We were dressed in all manner of uniforms. 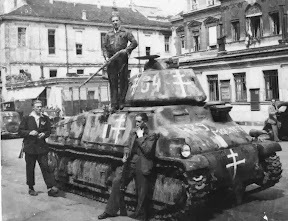 Around our left arms were bands of blue, white, and red with the Cross of Lorraine on them. The colonel asked what we wanted. We told him we were Dutch, and what we had been doing. We asked per-mission to join the army because we wanted to go home and to fight against the German troops. Believe it or not, he said without hesitating, "Sure, why not?" When I write this down now in 1999, it seems so unbelievable. Was this really me? Did all this really happen? Yes it did happen. And it was not the end. We were given an outfit, weapons and supplies. There was no difference to see between the regular soldiers and us. We were sworn in! The only thing we did not have was our dogtags. Therefore we wrote our names and date of birth in our leggings. On the 21 of August 1944, we suddenly became soldiers of the US First Army, 9th Division, 47th Infantry Regiment, D Company. Our outfit moved out and crossed the Belgium border on the 1st of September. At the border we liberated the little town of Beaumont. Then we moved on. A few days later, near Dinant, we crossed the river Meuse in wooden boats. Forwards we went with practically no resistance from the Germans. They moved faster then we could follow. In the middle of one night, we halted in a town called Ciney. It was very quite. No one was in the streets. Suddenly, a window opened and we heard a shout, "Les Americains." Within a second, hundreds came out of their houses and there was a feast. We were sitting on our trucks but had to move again towards Luik (Liege). We arrived in Luik on the 12th of September. From there, we went a few miles back to Jupille. We were in a park eating chicken out of tins when we were suddenly attacked by a single German Messerschmidt. He came over a few times while we stood behind trees. We changed positions every time he made a pass. We went through Verviers, Eupen, then crossed the German border near Roetgen. We took the small towns of Mausbach and Zweifall and some other villages. The night before I got wounded was a night I never will forget. The place we were in that wood had been shelled by the Germans for hours with their 88mm guns. That 88 was feared by the allied forces. It was first meant to be an anti-aircraft gun, but it could be lowered and then they could use it as an artillery weapon. We had dug our foxholes and there was rain and rain and rain. We had to cover our foxholes with our panchos that were a part of our outfits. You could hang the panchos over your shoulders but also you could build a shelter with them. It was too dangerous to walk during the night, the Germans were close by. Those who were ordered to keep watch that night were told to stay awake in their foxholes for 1 hour and then wake-up their buddy to take the next watch. My turn was from 3 to 4. The guy who woke me up in my swimming pool, the water stood about 10 cm high, gave me a watch, whispered something, and vanished in the dark. And dark it was. One could not see his hand before his eyes. After an hour it was the end of my turn and I had to wake up a fellow we called Red whose foxhole was close to me. The strings holding my shelter straight caused me to climb out at the end of my foxhole and I lost my orientation. I did not know anymore where Red's foxhole was. I made some steps, hit my head against branches and as inexperienced, wet, and frightened as I was, I decided to stay at the spot and stay awake rest of the night. I felt a tree and sat down. I heard a soft snoring sound just beside me. I felt with my hand and found a body. I shook it softly, and asked him, "Where is Red?" "That's me," was the answer. I gave him the watch and then asked him where my own foxhole was. He told me, I found it, went in and tried to sleep. This all may sound like a silly story, but it made such a deep impact on me that I will always remember it like yesterday. I believe only soldiers who experienced war can understand. On Monday the 18th, I was hit by shrapnel in my chest at a place called the Hürtgenwald. For me the war was over. It happened at 11.00 hours in the morning. I was brought to a field hospital where they tried to get the shrapnel out. During the following week I was transported from hospital to hospital. Sometimes by ambulance, sometimes by jeep. On Saturday the 23d of September I found myself in a hospital near Namur where a selection took place. Some were selected to go to Paris, others to go to the UK. I was lucky again, I found a label pinned on my blanket with the letters UK on it. The next day, Sunday the 24th, I was taken into a plane (the famous Dakota) and flown to England. That was my first air trip. After a week I was removed to an English hospital, Mount Vernon in Northwood on the Hills, just above London. There I had a second operation to remove the shrapnel, but again, the doctors did not succeed,. And so, I still live with a small piece of a German 88 in my chest. It has never caused me any trouble. In that hospital I had the honor to be visited by HM Queen Wilhelmina. A week later, (that must have been around the 20th of October) HRH Princes Juliana also came to visit me. In December, after my full recovery, I was screened by the intelligence service in the Royal Patriotic School. I then signed into the Princes Irene Brigade at Arlington House in London and was transferred to Wolverhampton, and later, in July 1945, back to Holland to Bergen op Zoom. Recollections of WWII by W. Homeijer, written in 1999. Mr. Homeijer passed away in Duiven, Holland on 9 March 2001.